The Center for Community Solutions Award for Public Service in Honor of John A. Begala was established in 2015 to honor those who have shown a great commitment to public service, especially as it relates to improving health and human services in Ohio. 2018: Sen. Dave Burke (R-26) was honored for his efforts to address health and social needs of Ohioans, especially as the chair of the Joint Medicaid Oversight Committee—which he played a lead role in establishing. A pharmacist by trade, he played an integral role in shutting down pill mills in Ohio, which was an early, vital step in addressing the opioid crisis. The award is named after John A. Begala, Community Solutions’ former executive director and a three-term member of the Ohio House of Representatives. Begala dedicated his career to public service and the human service field, with leadership positions at The MetroHealth System in Cleveland, the University of Cincinnati Medical Center, Greater Cincinnati Hospital Association and the Ohio Department of Mental Retardation and Developmental Disabilities. Begala believes that, “stripped of all trappings, health and social services are fundamentally acts of love and there are few better ways to make a living.” He retired in December, 2014. The 2019 awards ceremony will be part of the annual Celebration of Human Services program, which includes presentations of the $25,000 Anisfield-Wolf Memorial Award to a nonprofit organization and the Most Treasured Volunteer Awards. It will be held on Friday, October 25, at the Hilton Garden Inn & Gateway Conference Center. 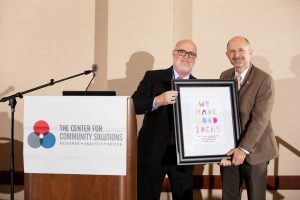 The Center for Community Solutions is a nonprofit, non-partisan think tank focusing on solutions to health, social and economic issues in Northeast Ohio. Established in 1913.